Start Your Study Abroad Journey with the TOEFL®Test..! Want to study abroad but don’t know where to start? 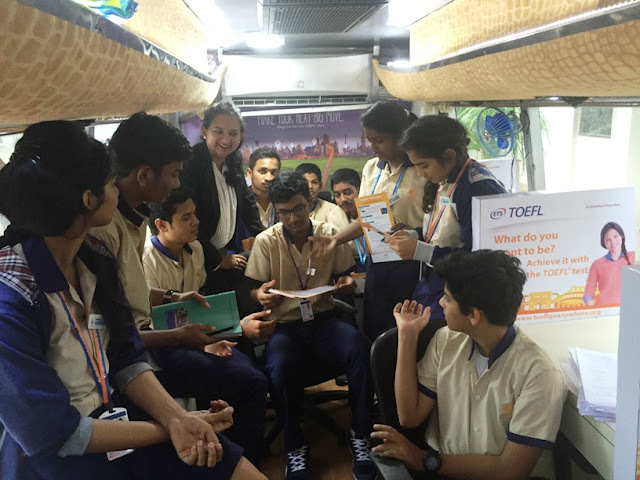 Keep a look out for the TOEFL® information vans coming to Hyderabad1st August 2016 onwards. Southern India to provide you with a one-stop shop for TOEFL test information, registration support and study abroad guidance. Jennifer Brown, Executive Director of the TOEFL Program. and guide you in the registration process for an upcoming TOEFL administration. TOEFL Test Preparation: The Insider’s Guide, through edX. information and other helpful tips. information about the TOEFL test,” said Brown. study abroad, it is important for you to stand out above the rest. Taking the correct English-language assessment is a valuable first step. 130 countries including Australia, the United States, the U.K. and Canada. recognized by more than 9,000 institutions in more than 130 countries. To date, more than 30 million students have taken the TOEFL test. on the TOEFL® Go Anywhere website at www.toeflgoanywhere.org. for people worldwide by creating assessments based on rigorous research.